“Children teach us to have humility and complete trust before the Father. They demonstrate the importance of discipline in our lives. And, important for me, they teach us how to slow down and appreciate just being with one another” I am truly blessed read this post and more realized how important our child to us just. Because, Children are heritage from the Lord, offspring a reward from him. (Psalm 127:3) Great and lovely post from my sister in Christ, Lauren. Thank you for sharing to us . Hello my dear blog friends, I am grateful to God today could come back to blogging after around a month not being active in the blog world. I have missed so much beautiful and awesome posts from all of you and later will try to take time to visit and reading your posts. We give thanks to you for the out pouring miracle and blessing upon us for the gift a baby son that You given to us. He is a gift sent down from Heaven. This precious blessing will always remind us how big is Your love. 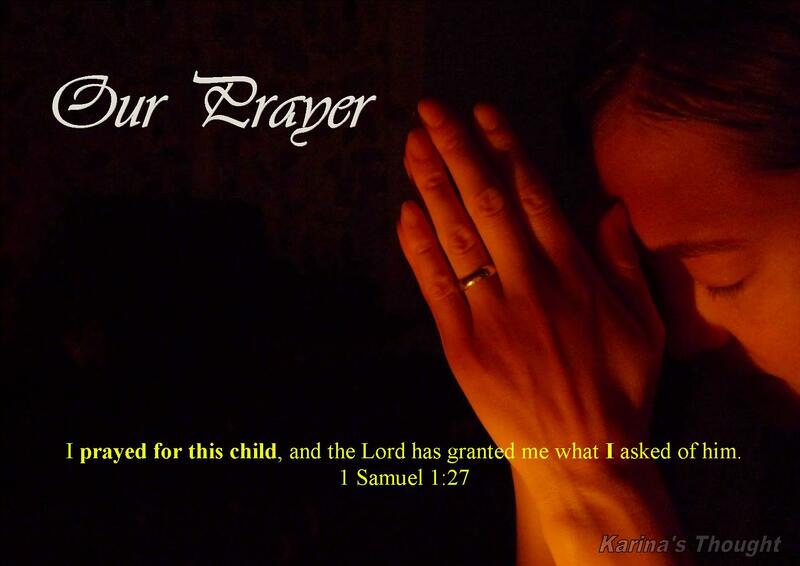 Our Heavenly Father, we pray and handed him into your hand. We let him life in your loving kindness, mercy, and wisdom. Please form him to be someone who always fears to God because fear of the Lord is the beginning of wisdom. May his soft and little ears always hear and receive messages through Your Word. May his little shining eyes will see how wonderful Your creation, can see how great God’s love to this world and it will make him loves You more than anything. May his hand will be strong so one day could reach out the world with the act of kindness and do everything according Your will. May his little cute feet will walk in the way of righteousness and every step he take is always based on fear to God, everything he does is always honor and glorify You. God, form our child to be someone who have wisdom to know when he weak and dare to face himself when he afraid. Form him to be someone who always proud and strong when one day he has failure and losing. But make him always has humble heart when he has successful triumph and always realizes that the every victory is not just because of his own ability but from God’s grace alone. Dear God, Make our little prince to be a man who not just hoping but also always accompanied by deeds. Lead him always in the way of ease and comfort, but if he should to be in under pressure, difficulties and challenges, let it all to be a lesson to him so he knows that life is not so easy and it all will teach him how to endure and struggle in life and will make him stronger day by day. Let him learn to remain stand up and toughen up in the midst of life storm. and when he feel alone among the darkness and hard times, he knows and realized that actually he not alone because You never leave him alone. Our Heavenly Father, teach him to always have compassion to those who have fail, teach him to always be motivated to lend a helping hand to those who in need with pure heart without expect anything in return. May he reaching dreams as high as stars in the sky but never forget that everything he will reach is blessings and grace from You not because of his strength and capability. Let him reach the brightly future without forgetting the past. Form him to be a wise man that is able lead himself before leading others.